Granit Technologies and Engineering (GRT) SA is committed to the development and application of sustainable technologies. The company and its strategic partners offer a strong pool of original and proven technologies to meet actual needs for high performance, energetic efficiency and sustainable resources and waste management, complying with the uprising exigencies in their domain of action. To operate as responsible corporate citizens, to target the risk prevention and the environmental care are in the center of the company concerns. Granit Technologies and Engineering (GRT) SA proposes an unique and patented system for the treatment of sludge and waste waters, based on the principle of wet oxidation. The non-biodegradable fraction of the influent is destroyed to produce heat and electricity in an ecological way, preserving the environment and the human health. Wet oxidation is a combustion in a liquid phase, at sub-critical conditions. Typically, the operating temperature is set between 150°C and 300°C, depending on the composition of the stream to treat. The process needs a gaseous oxidant: oxygen or air, and the reaction generates heat. The organic compounds are oxidized into H2O and CO2 and a residual quantity of small, easily biodegradable molecules. The process doesn’t generate any toxic gas emissions such as dioxins, furans nor fly ashes, on the contrary to the incineration. The Clean WOx® technology for the treatment of both sludge and waste waters benefits from long-term return of experience. It has low operating costs as it is combined with a cogeneration unit for electricity production. It also has reduced maintenance needs due to the implementation of ingenious patented systems. Liquid CO2, a product of the combustion, can be recovered and stored for further industrial valorisation. A non-exhaustive list of possible applications is presented below. Granit Technologies and Engineering (GRT) SA focuses on the realisation of projects that provide for the valorisation of non-recyclable plastic waste into diesel oil. The proposed plastic-to-fuel solution is a valid alternative both to landfilling and incineration as it enables a conversion of used plastic matters into product oil suited for various applications. The best quality products of plastic waste conversion can be obtained by processing mixtures of LDPE, HDPE and PP. PVC is not suitable and must be attentively pre-sorted, while other plastic types such as PS may be accepted into the process, up to some extent. The product oil is similar to fuel oil or diesel, depending on the chosen process conditions and the project goals. This efficient recycling procedure permits the plastic waste reuse as a feedstock for secondary life cycles. Granit Technologies and Engineering (GRT) SA approach to waste management is to elaborate integrative plans to maximize the resources and the energy recovery. In view to reach the closed loop (no waste) objective, the company takes part in the assessment of sources and quantity of waste in the selected area and proposes an integrative system of advanced technologies, leveraging on both proprietary and other processes, available on a partnership-basis. The integrative approach enables enhanced valorisation of waste and includes added-value services for the integration of recovered resources inside the local economy, using the newest effective technological solutions. The proposed solutions are based on proven applications and build relevant alternatives to incineration and landfilling. The benefit flowing from these alternatives is the environment and the human health protection, as a result of prioritizing the recycling and the recovery of the energy potential of the waste. The company offers its technologies under license arrangements, provides turn key realisations, proposes its technical expertise and the related pool of services. - Concept and detail engineering of new processes as well as interconnection engineering. - Process analysis and optimisation, including elaboration of the relevant technical documents for realisation of solutions. - Elaboration of risk analysis (HAZOP), functional analysis, specification of assemblies, procedures and manuals. 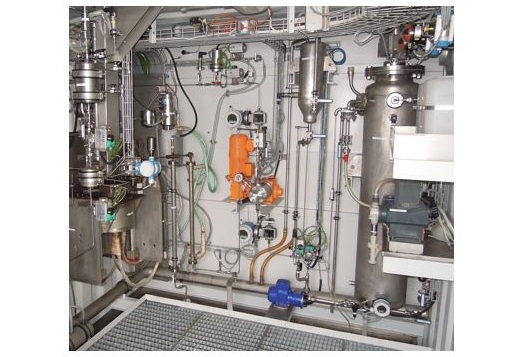 - Designing and constructing tailor-made pilot plants and prototypes. - Technical assistance during erection, commissioning, start-up and maintenance of industrial units. - Training of operators and technicians. - Supporting procurement activities and the proper tuning of agreements. - Supporting our clients R&D activities, through consulting, optimization, conceptual engineering and design. In the framework of pre-feasibility studies, we perform process characterization and development activities through laboratory and pilot scale testing. We conceive entirely automated pilots tailored for the specific processes, we scale up, implement and follow industrial prototypes. Aside from the promotion and implementation of already well backed-up processes, we continuously invest in and promote the innovation. The company favours the collaboration with research institutes and organisations to develop sustainable pioneer technologies. On demand, we utilise our laboratory facilities and pilot equipment to support our clients R&D activities. In the framework of pre-feasibility studies, we perform process characterization and development through laboratory and pilot scale testing. We can conceive specific, entirely automated pilots tailored for the client processes, scale up, then implement and follow industrial prototypes.